Back by Popular Demand! The Fireside is thrilled to present a brand new, live musical celebration featuring the wildly popular Fireside Band led by Fireside favorite Steve Watts! Also featuring a cast of super talented singers, this show is the ultimate rock and roll party!!! 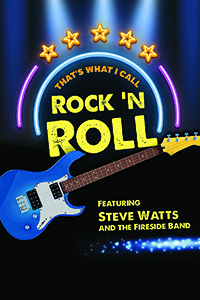 The Fireside will be rockin’ with the music of the 50’s, 60’s, 70’s, and 80’s!!! We’ll be paying tribute to some of the biggest rock superstars of all time such as The Beatles; Jefferson Airplane; Blood, Sweat and Tears; Janis Joplin; Prince; Led Zeppelin; Van Halen; Queen; Earth, Wind and Fire; Whitney Houston; Journey; Heart, and many more! This is an unforgettable night of rock and roll like no other! The Evening begins with our Signature Salad topped with Papaya Chutney Dressing and served with Freshly Baked Breads. Each show our Chefs prepare two special entrée selections in addition to these Fireside favorites: Barbecued Pork Back Ribs, Chicken Tenderloin Tempura with Brandied Apricot Sauce, Beer Batter Fried Cod, Shrimp and Scallops Fusilli with Tomato Butter Sauce, Fresh Atlantic Salmon, Beef Tenderloin and Roast Turkey from the Carving Station, Sweet Potato Soufflé, Whipped Idaho Potatoes and Roasted Farm Fresh Vegetables. Key Lime Pie for Dessert. Coffee, Tea and Milk are included with your dinner.